These cookies are amazing! I found the original recipe here on Pinterest, and actually made a few tweaks. 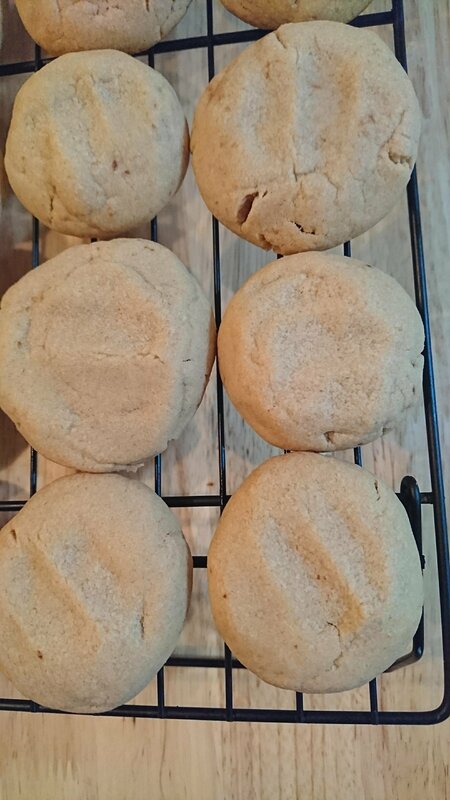 The original recipe had truffle filling that used peanut butter and butterscotch chips. I didn’t have butterscotch chips, so I substituted chocolate chips, and I’m so glad I did! 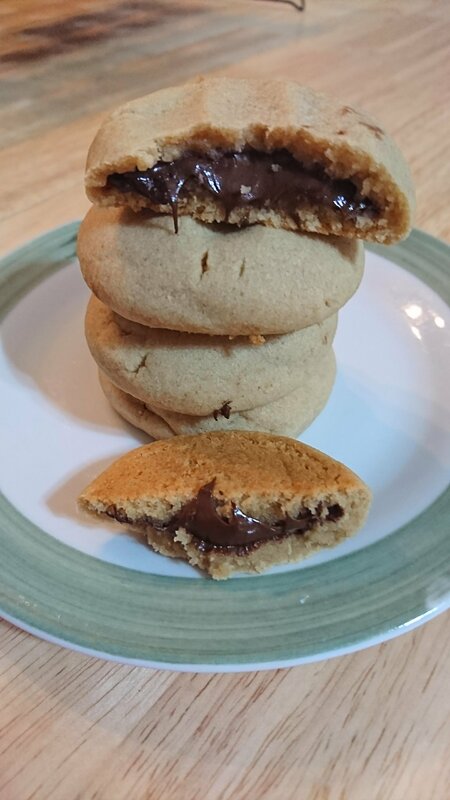 These became a chocolate peanut butter lovers’ dream! Paul was a huge fan of them, and not going to lie, they are AMAZING with tea (or in Paul’s case) coffee, or a huge glass of milk! These are decadent, and absolutely phenomenal. They go with just about anything. 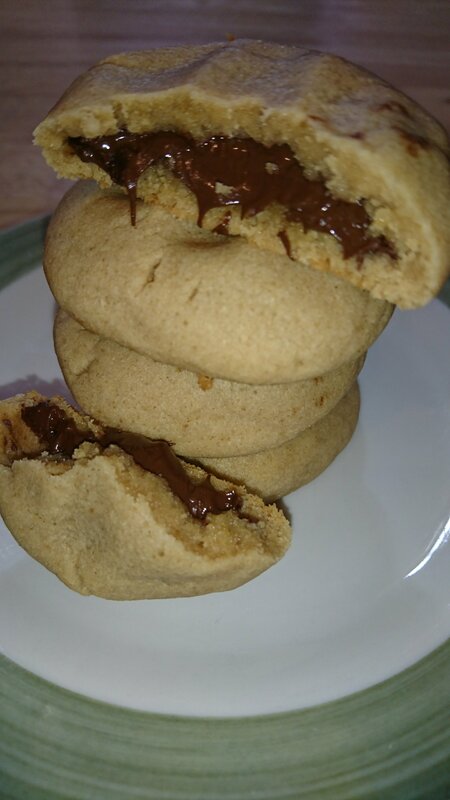 I honestly don’t have too much to say about these, but they were the inaugural baking experiment in the new house, and they turned out splendidly! Try them out, and you won’t be disappointed either! To make the truffle filling, place the peanut butter and the chocolate or butterscotch chips in a microwave-safe bowl and heat for 30 seconds at a time, stirring after each microwave session until smooth and well-combined. Refrigerate 10-15 minutes until mixture is cooled and thick enough to scoop. Scoop into tablespoon-sized balls, and refrigerate on a sheet of parchment paper until cookie dough is ready. To make the cookies, preheat oven to 350°F and line a baking sheet with parchment paper. In a large stand mixer fitted with a paddle attachment, cream the butter, peanut butter, and brown sugar together on high speed until light and fluffy. Beat in the egg and vanilla until combined. Add in the flour, baking soda, and salt and continue to beat on low until mixture forms a dough. To assemble the cookies, scoop out about two tablespoons of dough, and form around the truffle filling. Wrap around filling, and make sure dough is fully covering filling. Place on baking sheet, and flatten slightly. Repeat with remaining truffle filling and dough. Bake cookies for 9-10 minutes, or until cookies are puffed and edges are set. Allow to set on baking sheet for 10 minutes, then transfer to a wire rack to cool completely. So, this might be my last strawberry post for a while! Not forever, but just for now. We have found out that Paul is allergic to strawberries. Not deathly allergic, but just allergic enough that his throat gets a bit scratchy and he can definitely tell he’s had strawberries. I bought a bag of frozen strawberries a while back and had used part of it, but I had about a third of a bag still left in the freezer. Considering we’re moving soon, I want to try and use up as much stuff in our pantry as I can before the move. These scones seemed perfect, because I also made them on Sunday morning, when it was a little cool outside, and Paul had to work at seven in the morning. 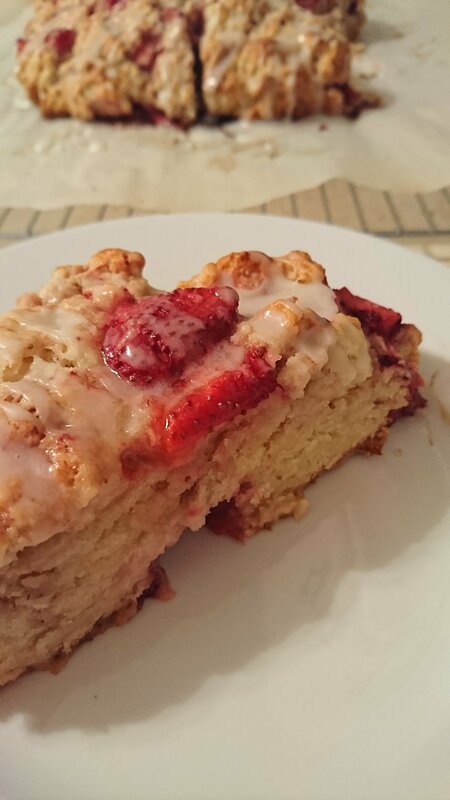 There is also the chance that I made them because I’m going back to Brooks later this evening and I wanted snacks… Who knows… I took to Pinterest either way, and found this recipe for scones, and I had everything for them! Woo hoo! I made them, and I am happy. 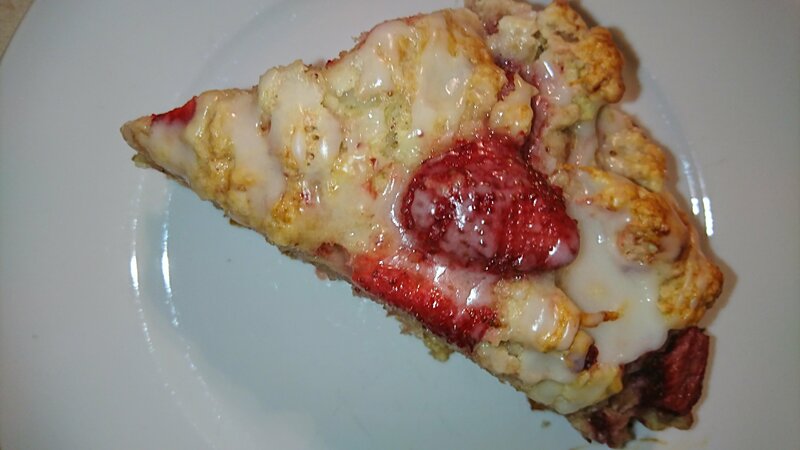 Either way, I used slightly more strawberries than the recipe called for, and they hadn’t quite thawed out all the way, so the scones took a little longer to bake than the called-for time in the recipe. Still though, you can’t go wrong with strawberry and lemon. Preheat oven to 400°F. Line a baking tray with parchment paper. Set aside. In a large bowl, whisk together the flour, salt, baking powder, baking soda, sugar, and lemon zest. Cut in the butter with a pastry blender or two knives until evenly incorporated. Whisk the egg and the milk together, then add to the flour mixture. Combine gently. 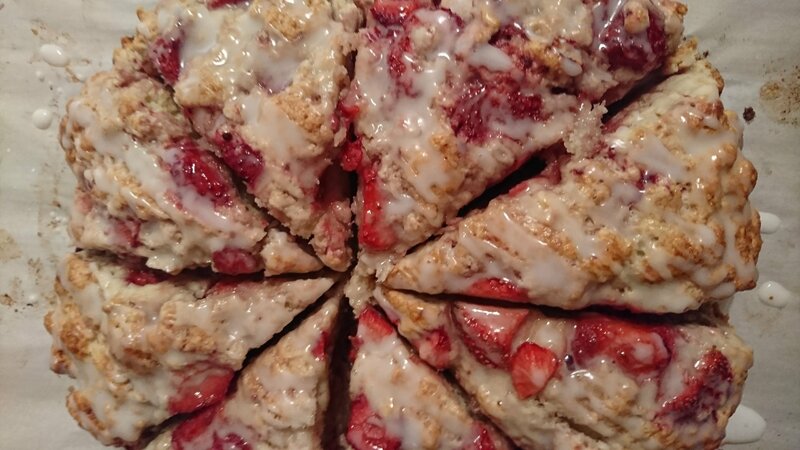 Fold in the strawberries to the dough. Roll out the dough, and gently form into a circle or square. Cut into 8 triangles, and either keep together (for softer edges), or pull apart (for crisper edges). Place on baking tray. Whisk together the egg and milk for the egg wash, and brush over scones. Sprinkle sugar over tops of scones. Bake in preheated oven for 16 minutes, or until golden brown. Cool for about 10 minutes, then make the glaze. In a small bowl, whisk together the lemon juice and icing sugar. Drizzle over warm scones, and serve.